Hello! As promised, I’m back with some of the new J.Crew fall arrivals. Fall is always my favorite clothing season and while I’m not rushing the rest of this summer, I was excited to get my fall J.Crew style guide and find there was plenty to love in the new catalog. This is probably one of my favorite rollouts in a while (and not only because it features a fantastic shade of flamingo pink). I found there was a lot to love in the way of neutrals and I enjoyed seeing styling that I can implement using my current closet items. I feel a post-summer closet purge coming on and I’m definitely trying to be a little more deliberate about what I’m adding to my closet this fall to make sure that it’s money well spent. But..in the mean time, let’s try on some clothes! I am splitting this in to two posts because I had more photos than I realized. First up, the Ruffle Front Chiffon Top in Vibrant Paisley and the Double Pleated Skirt in Vivid Paisley. I’m wearing a 12 in both so I would say they are true to size. I had to go back and make sure I had the print names right…vibrant…vivid, what’s the difference? They look the same to me! Typo, perhaps? 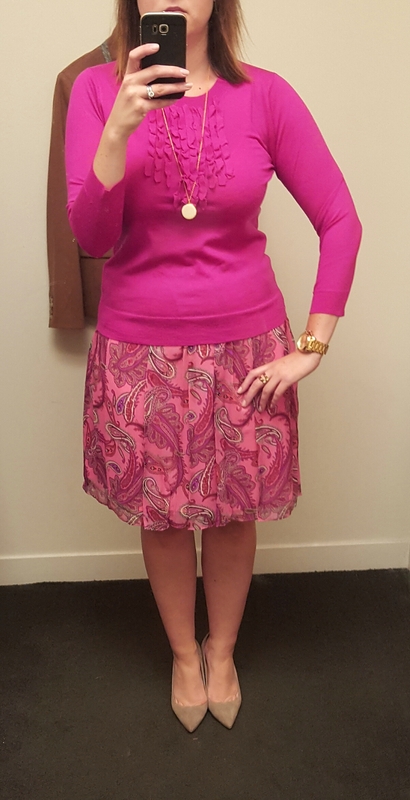 I tried it with the Tippi Sweater with Ruffles in fuschia blossom (shown below.) but it was a bit too much pink for me. The neutral shoes are a must with this much pink! I’m wearing a medium in the Tippi sweater and have found this next generation of Tippi sweaters runs generous as I’m a medium or large in tops. Next up are the Rhodes pant in Italian wool in wild flamingo. I’m often a 14 in suiting pants (which end up gaping at the waist) and these are a size 12. They just fit and you can see where they’re pulling a bit in the leg. I wouldn’t have worn these with a tucked in top so the 14s might be worth a try but I’m a little worried they’d be too big. The wool on these is woven and I’ve seen several comparisons to the wool café capris of a few years ago which I would agree with – but these have a thicker weave fabric. I’m not personally sold on the fit for me though so these were a pass for now. I do really like the thicker cuff on the bottom. Next up, the Edie Top in Shirting Stripe. I was on the fence on this top but couldn’t stop thinking about it and had to see it for myself. It runs true to size, I’m wearing a 12. I took it off and put it back on so the sleeves are scrunched up and I didn’t notice until later. I am back and forth in my opinion of this top. The ruffle needs a little fluffing and I tried it on with the pink pants too but I liked the black pairing much better. 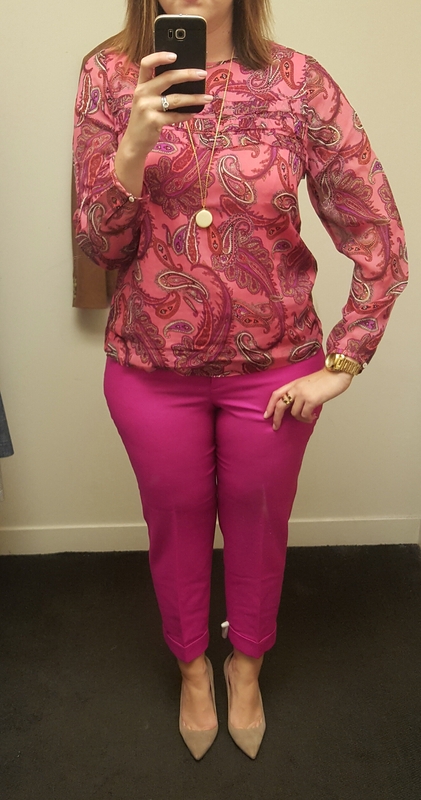 You can see the pairing with the pink pants on my Instagram page here. 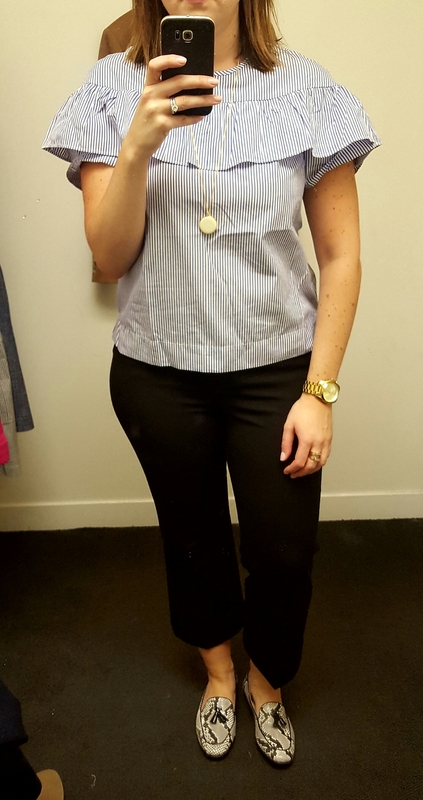 I love the shirting stripe and this made me want a basic top in the same stripe! This enamel necklace is growing on me too. The loafers are true to size as are the Teddie pants. I also tried the Ruffle Top in Shirting Stripe to see if I liked this better than the Edie top. This is a size 10 so it runs a bit large. This is cute, it has an open back but I found these ruffles to be even more cutesy than the other top. Here’s the Edie Top in Shirting Stripe paired with the Regent Blazer in Warm Camel. This is a size 10 which is the smaller of my two blazer sizes and the size of most of my older Schoolboy blazers. I have been wanting a solid camel blazer as the one I had from Factory wasn’t quite the right shade of camel for me. I have a few of the heavier wool Regents from last year and I really like this lighter wool solid version and I can’t believe this is the first time I’m trying it on as I like the fit even better than the heavier wool ones I own. The natural state of this blazer is a popped collar but this current style guide shows it with the collar turned down which you can do with it as well. This is at the top of my wishlist right now and I am loving some of the looks in this month’s style guide featuring a camel blazer and more neutral pairings. Lastly for this post is the Monday dress in Fiery Sunset. 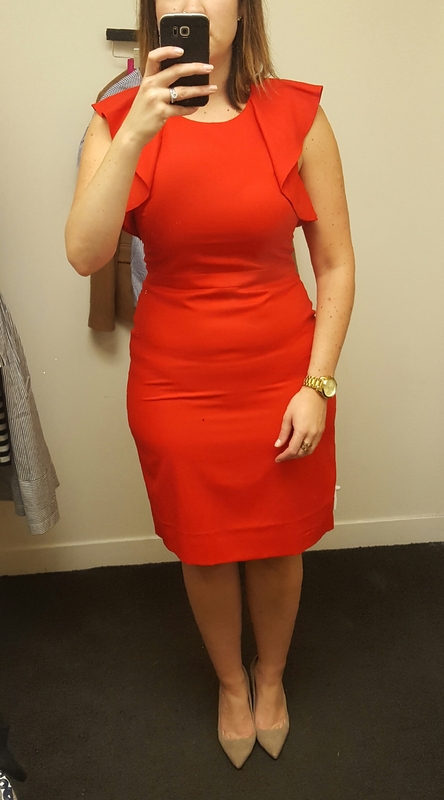 This is a size 12 and as you can see, Spanx would be needed. The lighter color highlights any imperfections but the cut of the dress is beautiful, it’s a work-appropriate length and while the sleeves are a bit much for me, you could throw on a blazer and be good to go. So, that’s it for now…I’ll do another post with the rest of my try-ons. How about you, what are you loving from this rollout? Any favorites from this post? Would love to hear what you think and thanks for visiting! I’ve been following you on IG for awhile and just found your blog! So fun! These are some great pieces – thanks for the reviews! Amanda, thank you so much and thanks for stopping by and commenting! Thanks for reviewing so many items. I love the pink on you, so fresh and pretty. 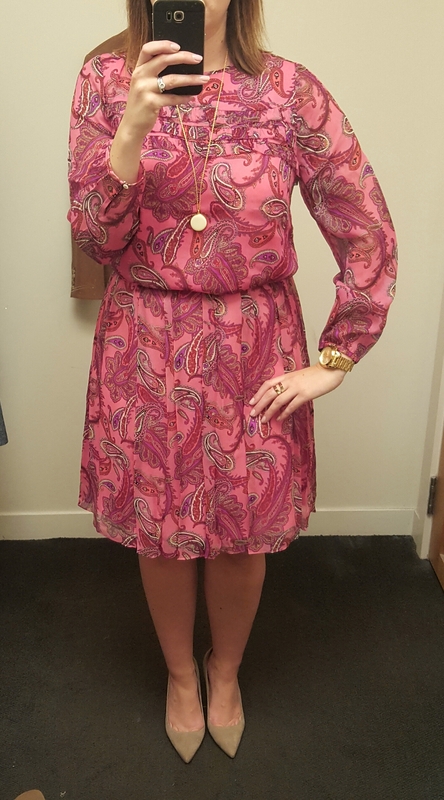 I wasn’t sure I’d like pink paisley, but it looks really nice. The fit on the Monday dress is so perfect. Professional looking and pretty! I’ve been on the fence about the ruffles. I prefer the Ruffle top to the Edie. The Edie just looks odd to me with the ruffle, neckline and sleeves. Maybe if they’d made the neckline more open, like a ballet or boatneck. Thanks @maryeb. 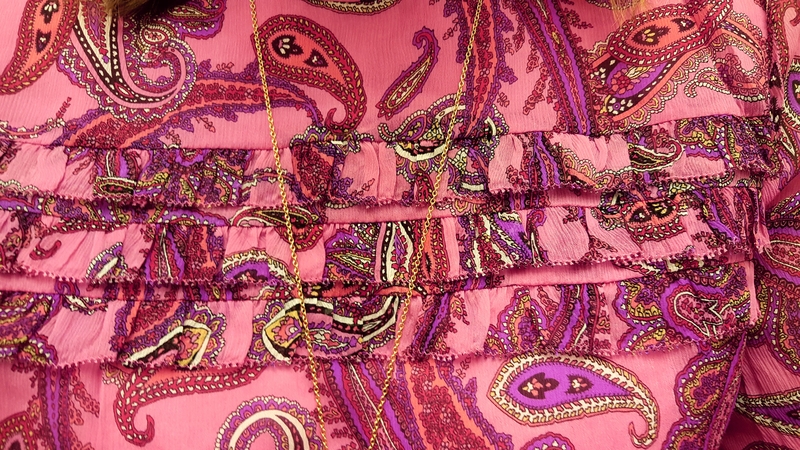 The pink paisley items were a surprise love for me too…I’ll be waiting for sale and snapping one up! Thanks for stopping by and taking the time to comment. I love your reviews! I follow you on Instagram, but love all the details you include on your blog. Hope to see more reviews! Thank you so much!! Yes, hoping now that it’s getting in to fall (my favorite clothing season!) I’m trying to get on a better schedule of reviews. Thanks so much for visiting and taking the time to comment.